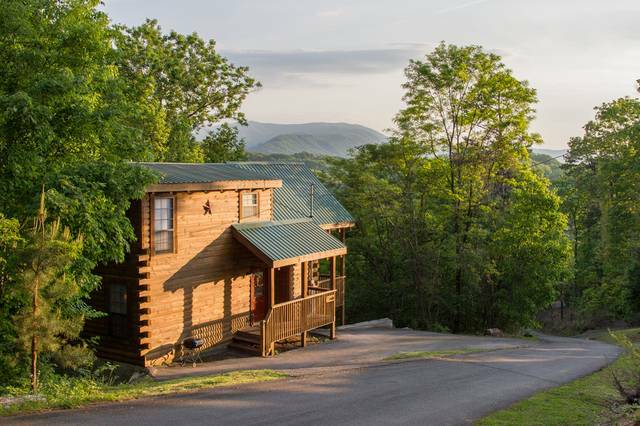 A charming, peaceful mountain getaway with views to the mountains in the distance, Nature's Nest is a perfect retreat to celebrate your anniversary or take the kids to the Smokies' for their first vacation. This cabin is located along a quiet, dead-end street just a few miles outside of Pigeon Forge. You can even see the Dollywood fireworks display every summer night at dusk. 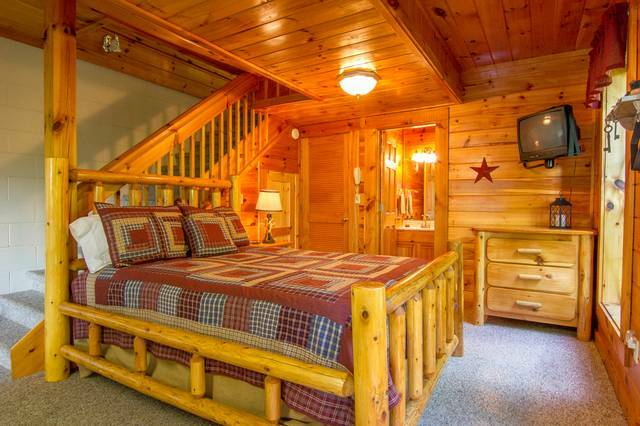 The upper loft King bed is like sleeping in a TreeHouse. 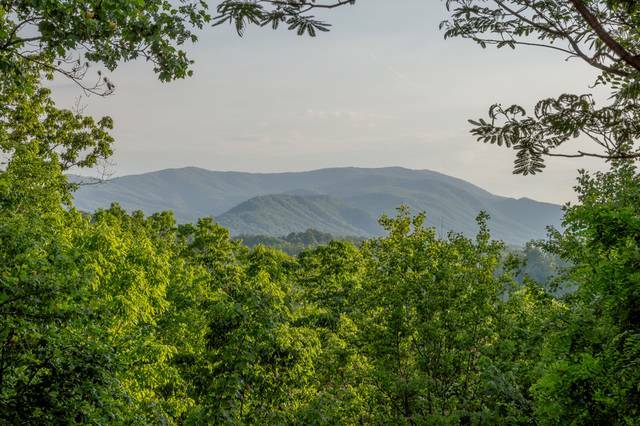 You can look out to the trees and mountains in the distance every morning. 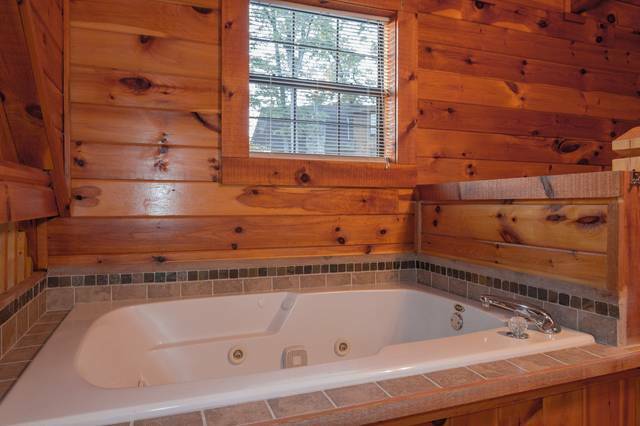 The jacuzzi tub offers similar views. A full bathroom is in the loft as well. 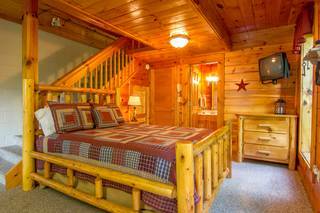 The lower level of the cabin houses the queen bedroom and another full bath. There's also a stack washer and dryer in the closet so you can keep your laundry under control. Kids will enjoy this bedroom because they can wake up, roll out of bed and play a game of pool before they've had their first bowl of cereal. The sofa next to the pool table is not a sleeper sofa--it's just for sitting. The cabin has a sleeper sofa in the living room area--the leather sofa--and it folds out to a queen bed. The kitchen is well-equipped by the owners with everything you'll need to make meals at home. Dishwasher, microwave, coffeemaker, ice maker, toaster, crock pot, etc. are all provided along with dishes, utensils and pots and pans. 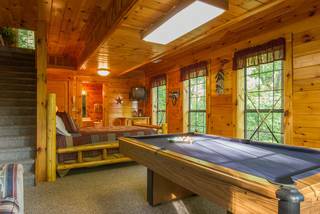 The living area has a large flat screen TV with standard Comcast cable service and is ready for game day or just watching your favorite race or TV show. Comcast high speed wireless internet is available throughout the house and on the deck. For your convenience, the cabin phone offers free long distance service to anywhere in the continental U.S. 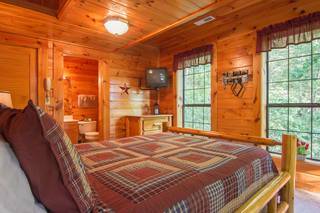 Nature's Nest is a warm, inviting cabin in the beautiful smokey mountains. 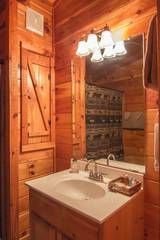 The home was very clean, very comfortable and full of rustic and lodge style accents. 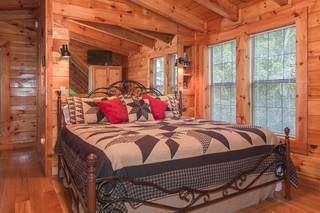 Quaint and cozy, its a wonderful place to relax and unwind. 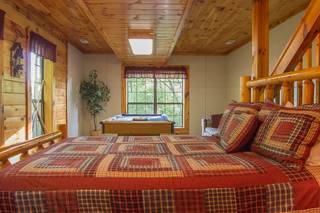 Located only minutes from all the local attractions its the perfect base for a stay in the Dollywood area. Check in was easy and communication from the owners was exceptional. No detail was left to chance. We thoroughly enjoyed our stay and would recommend this home to anyone looking for a few quite and peaceful days in the Pigeon Forge area. Manager response: Tammy, thank you so much for recommending us to others. I'm so pleased you had a good experience at Nature's Nest. I'm glad you liked the location, too. The drive is pretty going to and from the cabin as you wind past the hilly farmland down the road. Please come again anytime. 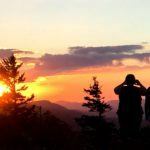 We would love to host your next visit to the Smokies! We loved staying here. Thank you so much for sharing your wonderful house with us. We will be returning. Manager response: I love to hear that, Kristin! We would love to have you back again. 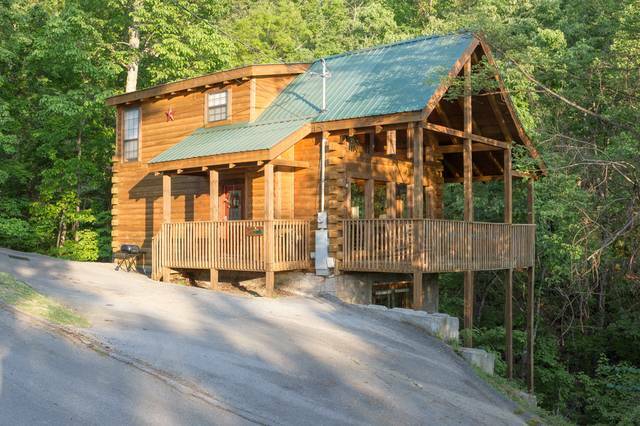 We traveled 8 hours to get to this cabin, and it was a great experience. We're use to taking beach vacations with our 10 & 12 year old, but wanted something new this year. It was amazing! The cabin was clean, and looks exactly like the pictures. We had a great time playing pool at night with the kids after long days of hiking, ziplining, shopping, and eating. You do need to mentally prepare yourself for the road leading up to the cabin, but by night 2 we were pros. Basically, drive slow and be cautious to your surroundings (and if it makes you feel better tap the horn every now an then to alert potential drivers coming down). We were bummed we didn't see any bears, but maybe that's not so bad 🙂 The cabin had a great view, just like the picture shows, and we had a great time. 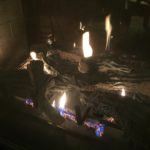 We rented a movie from redbox one night and had a family movie night curling up on the couch with the fireplace going. Enjoyed the family games that were there for us to use also. 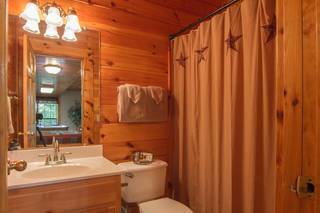 We have great memories from this vacation, thank you for making the cabin feel so inviting with no surprises. 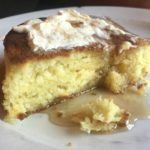 Manager response: Thank you, Amy, for sharing your family's experience at Nature's Nest. I'm so glad you enjoyed the cabin and everyone had a good time. We love hearing that guests spent time together at the cabin just having fun times together. 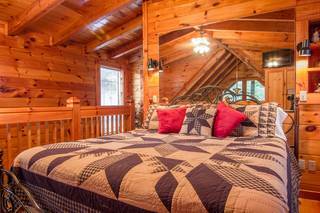 The owners, Tony and Sherry, have put their heart into the cabin and love sharing it with their guests. Thank you for the kind words and we hope you'll return if the mountains call you back again. We have no beaches but we sure have fun! 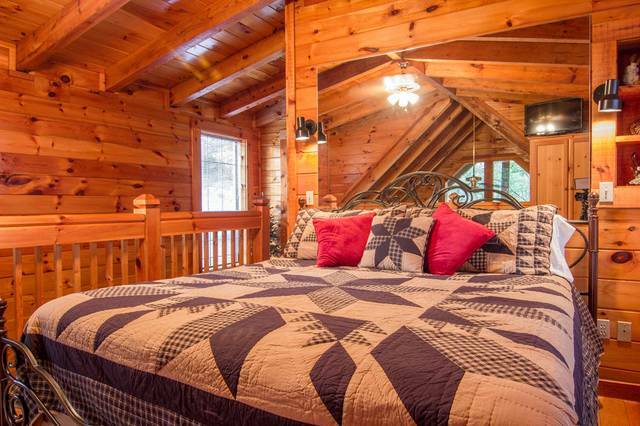 This cabin was the perfect choice for several reasons. It's only a couple miles up from traffic light #8 (Dollywood Lane) in Pigeon Forge so it's close to Gatlinburg and Pigeon Forge. It's super clean! We're very particular about cleanliness and this place was spotless. 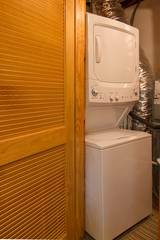 The owner thought of every detail to make it an enjoyable stay. There were movies, games and snacks for the kids. They had coupon books for local attractions and basic necessities. The linens were fresh and clean. They didn't cut any corners. 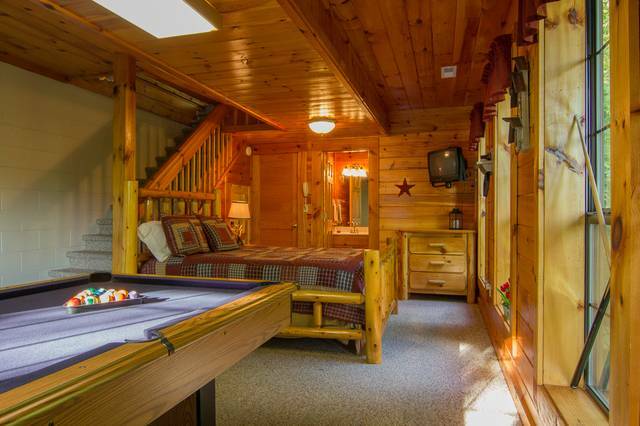 We took teens and they liked the separate sleeping quarters and 3 different levels. It's open (no doors separating the floors) so they had their own space but it would be easy to supervise younger kids and not feel like they were too far away. The cabin itself was nicely decorated and felt fresh and new (again, cleanliness is a big issue for our crew). The view is great. We didn't use the hot tub but it's a nice feature. This is definitely the cleanest, nicest cabin we have stayed in while vacationing here. We will book again when we come back. The Property Manager was attentive and kind. All and all, it was a great experience. Manager response: Jennifer, thank you for the review. I just sent a copy to our housekeepers--Michael, Donna and Heather--to let them know you were very pleased with their work. They are the backbone of our business and it's wonderful when they receive a shout out from the guests 🙂 I'm sure the owners will be pleased you enjoyed it too! They make regular "work trips" here and are always fixing, updating and replacing things to keep it in good shape. Thanks for being our guests and we hope to host you again someday! This cabin is just as pretty as the pictures show. Great view from the hot tub on deck and from the many windows. We loved waking up to the morning light outside our bedroom window. Well equipped kitchen, movies, games, laundry soap (which we forgot). You have to say a little prayer going up and down the road cause its pretty steep but we never had a problem. 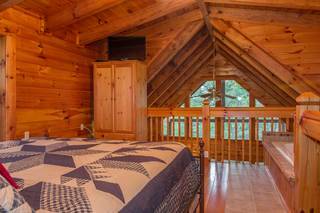 I would recommend this property to couples and those traveling with teens - preteens. They will love the pool table and having their own level! Manager response: Aww, thank you Sherron for the kind words. It's so nice to hear that guests notice the details--even the morning sun coming through the windows. It is pretty up there. Thanks for letting us host your stay and I hope you'll make another visit to Nature's Nest soon!